President Kenyatta’s opportunity to show that he had the potential to be a transformative and not simply a transitional leader was probably lost within his first year of office. Dealing with the charges that he and the others faced at the ICC was always going to be tough. 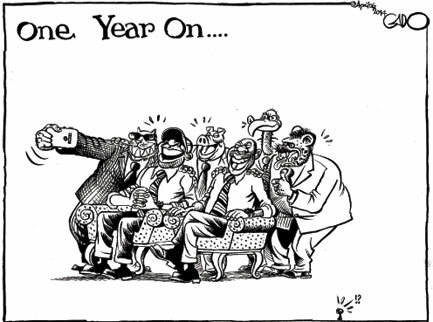 Creating for himself the possibility of being a KANU reformer to change the reactionary system in Kenya like a Suárez in Franco’s Spain or a Jaruzelski in communist Poland, or even a Mandela in apartheid South Africa, was tantalisingly on the table as the first president under the new constitution. But the Overton Window has now closed on any real business. The both entertaining and maddening “he-said-she-said” revelations have confirmed the already-known yet still unprecedented extent of corruption. President Kenyatta will be judged as being unable get a grip with a weak and under-performing government. Success in politics and business is hard, and requires a lot of thought about what it will take to succeed. It seems that President Kenyatta has just not been up to putting in the effort. But what else can be learnt from the Kenyatta presidency? First, there is a need to recognise some common (cognitive) biases. One is the outcome bias. Since pretty well everything has gone wrong – from insecurity to the slowing of the economy – this is seen as the fault of the President. Another is the halo effect: the idea that because someone is a good/bad person, he or she will do good/bad politics, or because they are rich that they are incorruptible. The person might simply be lucky/unlucky, and be in the right/wrong place at the right/wrong time (business leaders often overlook this and delude themselves that their skills and foresight alone are responsible for a company’s success). Second, if we share a tendency to pay undue attention to the character of politicians, then perhaps we can acknowledge that often we – like well-meaning politicians – also tend to trust other people too much, projecting on others our own decency. President Kenyatta has perhaps fallen into this trap with some of his friends and colleagues. Above all, however, there is tendency to overlook the underlying power structures and political culture that constrains development in Kenya. There is the expectation that political ends can be achieved if only the ‘right’ person or people are in charge. But capitalism is self-perpetuating, its ideology promotes self-reliance and small government in so doing it sustains inequalities, while it hands capitalists control over investment and in effect the economy. Can politicians overcome state-sanctioned inequality, or does political office corrupt and enslave them (the “iron law of oligarchy“)? There is a Japanese proverb: “vision without action is a daydream; action without vision is a nightmare”. We are exasperated by the Kenyatta presidency, while our anger is rooted in disappointment but should be directed at the failures of Kenya to achieve social democracy through its post independence parliamentary systems. on that basis, anything is possible.